Corrugated Roads and Vehicle Damage. Some corrugated roads are so bad that some people have actually turned around and given up, much due to not knowing how to deal with it and sometimes the road is really that bad it comes down to pure willingness. 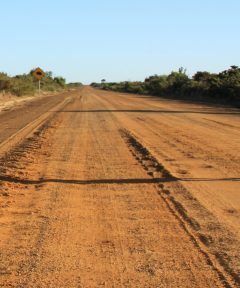 This is common on unsealed roads, this includes: gravel roads, sand tracks, lime stone tracks, outback roads and dirt tracks. The only way to soften the vibrations is to lower the tire pressures and find the right speed to match. Sometimes going too slow is worse than going fast and vice versa. One road could require 30 PSI at 70 kph and another could be 20 PSI at just 40-50 kph, you won't know until you try. In some cases highway tire pressure's at 90-110 kph will do the trick, at these speeds caution is paramount and should only be used if within the speed limit. Firstly just get the speed right, if it's still too bad drop the tire pressures a little bit. The roads can be so harsh that they break CB aerials, shock absorbers and loosen bolts. If driving on really bone rattling corrugation for lengthy distances it would be wise to stop now and then. Every 45-60 mins or earlier would be a good idea, as this will give the shock absorbers a bit of a rest. With continues driving in these harsh conditions tiny bubbles will form inside the shock absorbers over time as this constant vibration will heat the shock absorbers. This excessive heat combine with the tiny bubbles can cause early fading and reduce the effectiveness of the 4 wheel drives suspension. Stopping now and then for 10 mins can reduce the impact caused and will give the tiny bubbles and heat time to disappear. Prolonged driving will also cause bolts and nuts to loosen, this is no problem as long as you or your mechanic check and retighten them. Plastic aftermarket hinges and locks are prone to breaking and anything metal screwed into plastic will more than likely loosen before anything else. Recently returning from Steep Point I had to fix my rear door on my canopy, there were two metal screws in a plastic part. One side was completely broken off and the other side was loose due to the screw being rattled out the entire way. After that I thought that's not too bad considering we drove this badly corrugated road 4 times (total distance of 520 km) the road in question is "Useless loop road" the only way to Steep Point by land. Well the canopy door wasn't all the damage that had been done. My custom roof rack fittings had taken a beating and were only held on by two of the 4 fittings. After taking one a gnarly sand dune with deep holes at speed the roof rack gave way and was hanging of the side by one single bolt. Had I checked my 4x4 properly when I returned this would have been prevented. Make sure to check your vehicle after driving on corrugated roads. Leave Corrugated Roads And Go 4 Wheeling In Western Australia.